I used pretty much all of the same nail polishes for this design. The pink is Floss Gloss "Perf" and the gold is Salon Perfect "Gold Leaf". 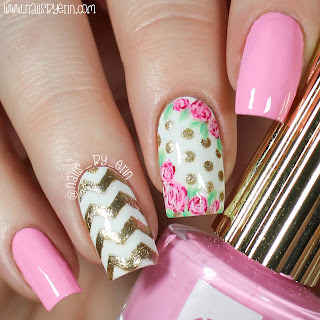 My favorite part of this mani is the combination of the polka dots and the floral pattern on my middle nail. I did the polka dots a little larger in this version of the mani, which I'm not sure I like, but I can personally see an improvement in painting my roses freehand. 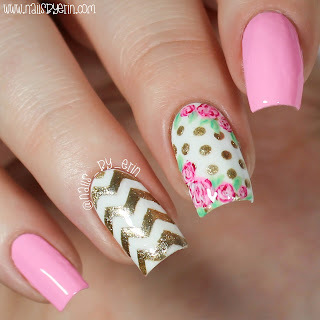 I also used a medium chevron vinyl from Snail Vinyls on my ring finger. You can use my code NAILSBYERIN for 15% off your purchase! I hope you all love this design as much as I do!